Work in Progress Wednesday #7 - Oops I did it again! I know I should be finishing up some patterns or unpacking boxes or filing or loading new products on to the website but I've got myself distracted again. My cousin has just had a beautiful baby boy and it seems so rare to make something for a boy (we're a family of girls) that I got too excited to wait until the jobs are done. 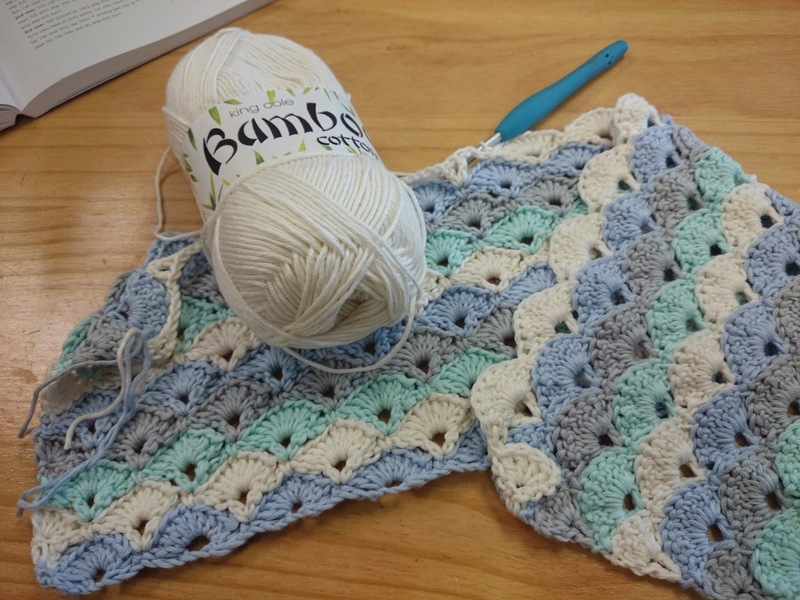 ... picked a stitch from my bumper book of crochet stitches and started on a blanket for the littlest member of our family. It may seem a bit last minute to wait until the baby is here so I feel I should point out that I was organised enough to knit a cute, neutral cardigan when I found out the baby was on its way but I'm also disorganised enough that I have absolutely no idea where I've put it!!! It looks like it's going to be another race to the finish. My cousin lives in Luxembourg and my sister is stopping by to see them all on an epic tour across Europe in a couple of weeks so I better get a wriggle on. By the way, I know this is the wrong side of the stitch, but I think it looks really beautiful. Very nice choice of colors. I love the pattern too. Believe me I think we disorganized someway or the other. I have had to stop buying yarn because I have so much that I don't where what colors are.